Hello! Finally got another game of Fantasy in, this time a rematch of Skaven against High Elves. 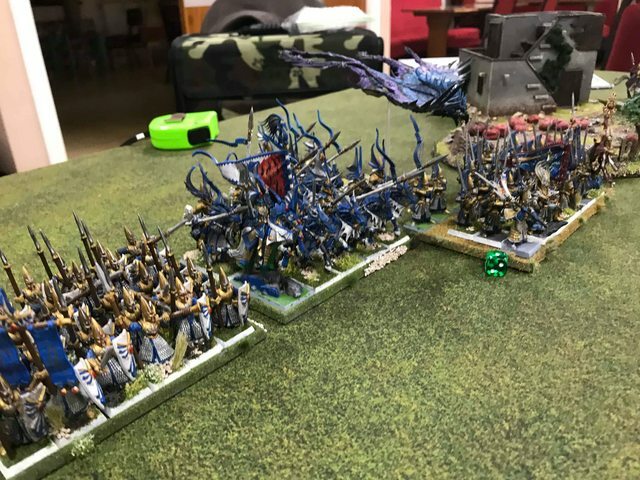 Both of us brought different lists to switch things up a bit, get new models into the action, and just try out a different army. 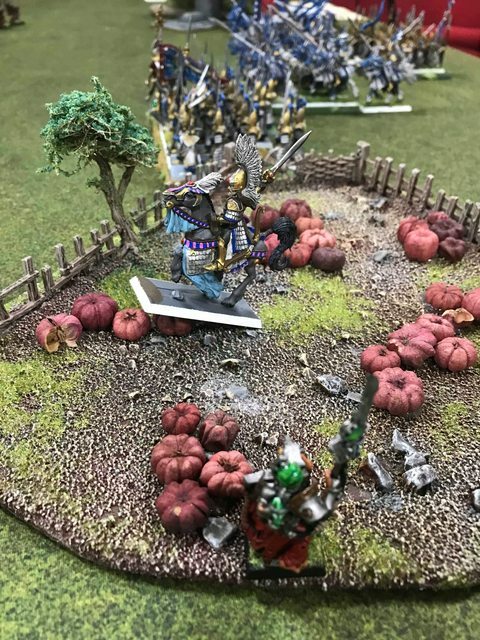 There was an impassible forest-type thing about a foot from the right edge of my table edge so I decided to use that as an anchor for my right flank. A farm on my left provided the same purpose. I dropped Ellyrian Reavers on the far side of the farm to keep the center open. 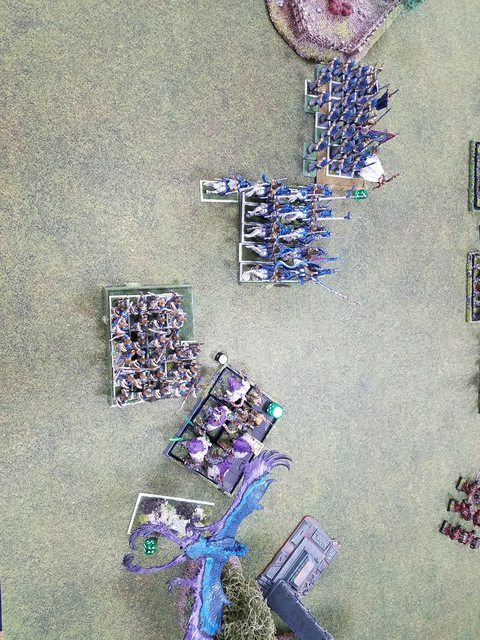 The smaller Spearmen block went on the far right of the Elven flank with the other Spearmen block next to it. The Dragon Princes took up center station and the Swordmasters went to their left. The Phoenix dropped behind the Swordmasters and all characters went to the Swordmaster block. 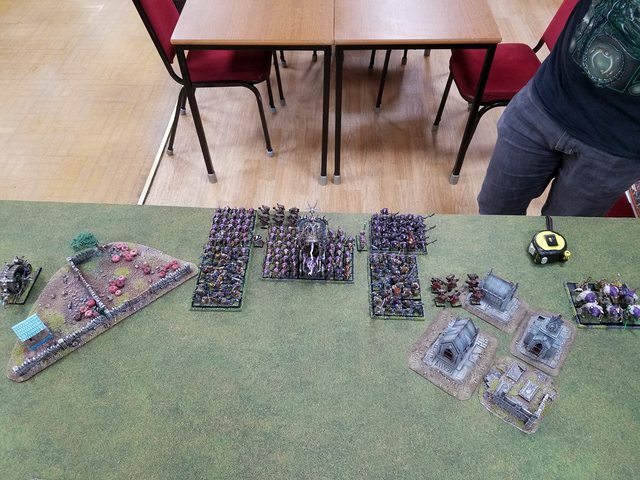 The Skaven counter deployment had the Rat Ogres on the Skaven far left. The center of the Skaven line was held by the large block pushing the Bell flanked by both Slave blocks. The Stormvermin went in right behind the Slaves on the Skaven left and the Clanrats behind the Slaves to the right. 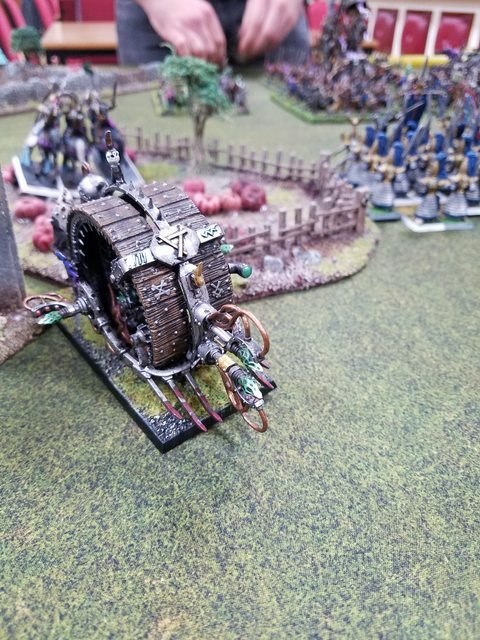 The Doomwheel held the far Skaven right. One unit of PWG went inside a mausoleum we were treating as a forest and the other PWG unit went behind the Bell. 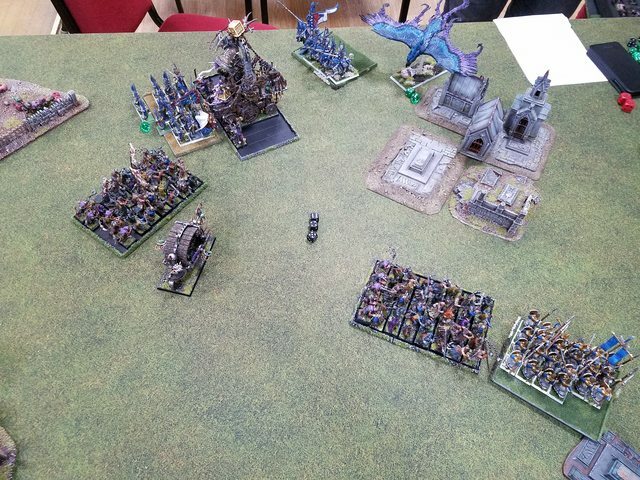 The BSB went into the Stormvermin, the other Chieftan into the Bell block, and the Warlock Engineer just outside the Clanrats as he couldn't fit in first turn. My plan was to hold back a bit and use magical artillery to whittle the hordes down. The Skaven have almost no shooting, so I don't have to worry about getting into combat super fast. The Reavers would shield my left flank as long as they could against the Doomwheel and the Spearmen blocks would refuse the right flank. My center had the Dragon Princes and Swordmasters with Phoenix backup to smash through the Skaven center. I figured Dragon Princes hit hard on the charge to kill lots of rats and rat blocks are one of the few things they can grind decently enough, while Swordmasters are the king of block grinding. 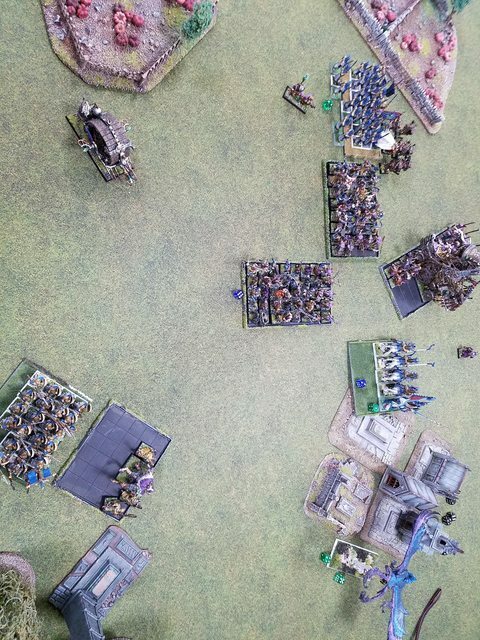 The center advances a bit, Reavers move up the flank to get in the way of the Doomwheel, one Spearmen block wheels to the right to face off against the incoming Rat Ogres. 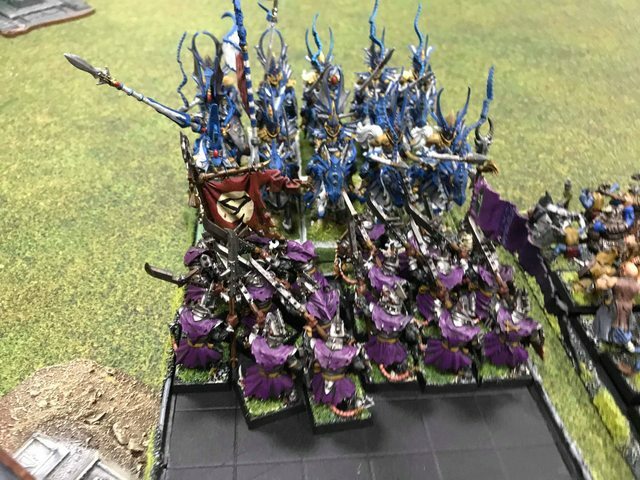 The Swordmasters march close enough to fire off Soul Quench, but no farther. Magic is a dismal 2 dice phase, so the Phoenix gets weaker. Soul Quench kills a disappointing 3 Slaves. The Skaven advance as well. The Clanrats and Stormvermin move out from behind the Slave blocks to widen the Skaven line. The Bell holds back a little bit to not get in charge range. The PWG move up to the edge of the Mausoleum and the Rat Ogres march far forwards. 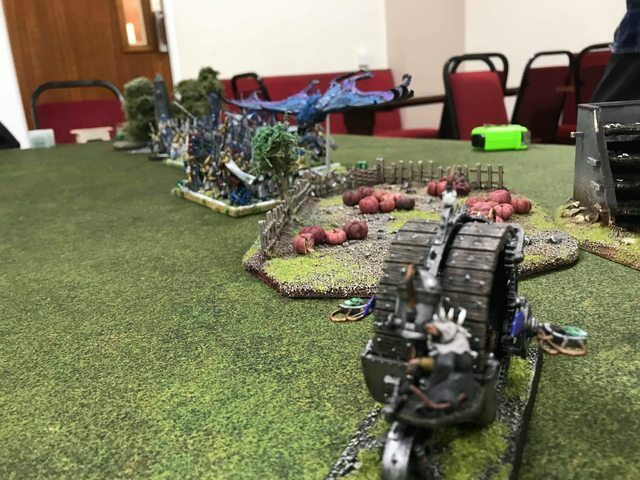 The Doomwheel rolls high and pushes towards the Elven flank. Magic tosses Warp Lightning at the Frostheart who takes a wound due to the ward save having been reduced to 6+. The Doomwheel kills 2 of the Reavers but they pass their panic test. The Elves shuffle a bit, pulling the Swordmasters and Dragon Princes back a bit to keep out of standard charge range. The Reavers move in to redirect the Doomwheel away from the Swordmaster flank. The Phoenix moves to the right flank to stay away from the Doomwheel zzaps and to support combat against the Rat Ogres. 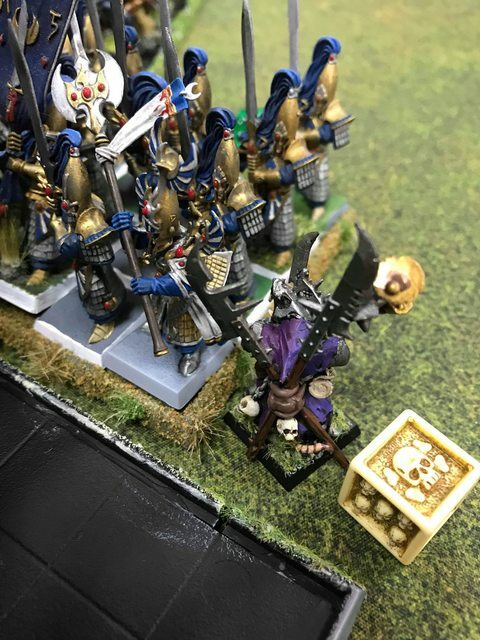 Magic heals the Frostheart back up to full with Apotheosis, Soul Quench kills 3 Stormvermin, and with a good roll Convocation goes off onto the Bell unit killing 14 rats. That magic resistance from the Bell was not anticipated and was very annoying. 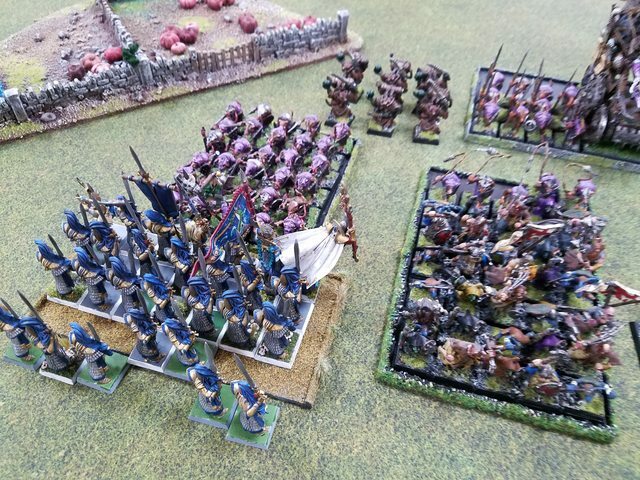 The Rat Ogres fail their Frenzy test and are forced to charge the Spearmen. Not to worry though, it's a 10" charge, just as planned. Except they make it. Hmm. The Doomwheel then continues its zippy fast movement past the Reavers into the rear of the High Elf line. Hmm. The Screaming Bell casts Scorch but the Swordmasters are unfazed with a minty fresh 2++. 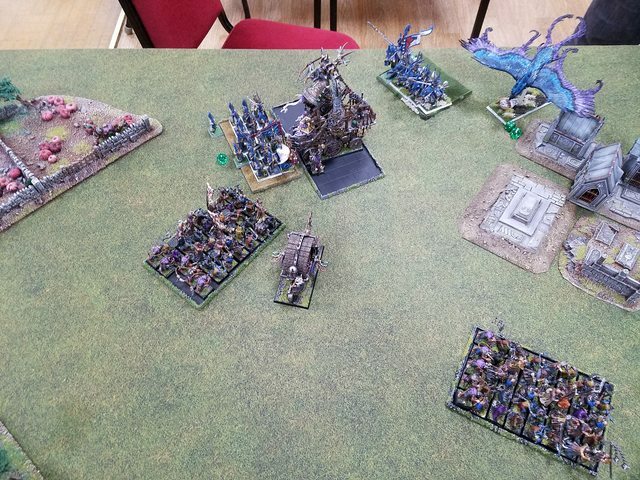 Warp Lightning onto the Dragon Princes is dispelled while Blessed with Filth goes off on the Rat Ogres. Skitterleap then is cast on the Warlock Engineer putting him on the High Elf flank. This means Convocation is not dispelled, though, and 18 more Clanrats go down along with the Bell taking a wound. Two more Reavers are shot by the Doomwheel. The Doomrocket then gets fired. I think my opponent was aiming for the Dragon Princes but again the range rolls were extremely high and the shot goes very long. 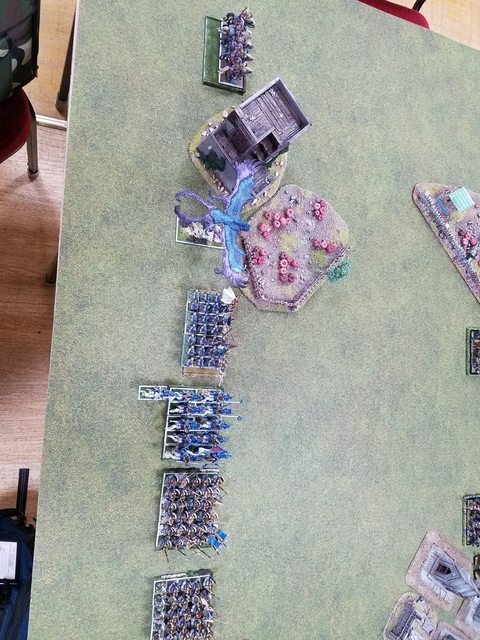 Right into the Spearmen block facing the Rat Ogres. 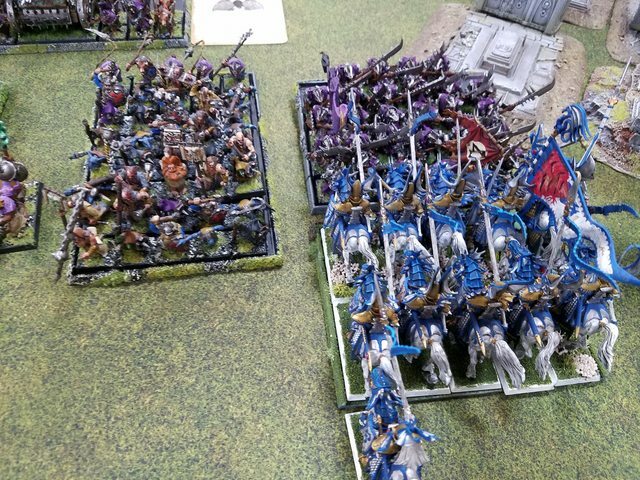 17 Spearmen are blown to bits, though a Rat Ogre is also killed. 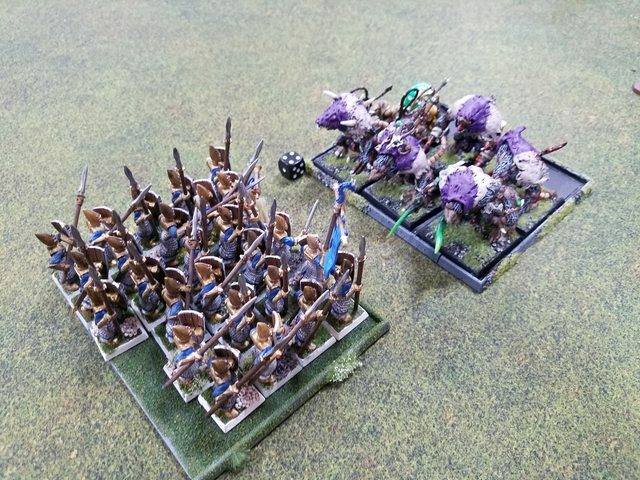 The remaining 8 Spearmen manage to wound the Rat Ogres twice, but are slaughtered to an elf in response. 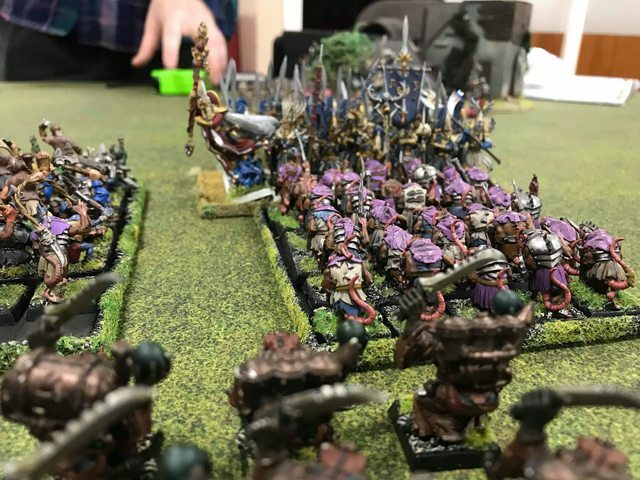 The Rat Ogres overrun and slot the gap between the Phoenix and the other Spearmen. 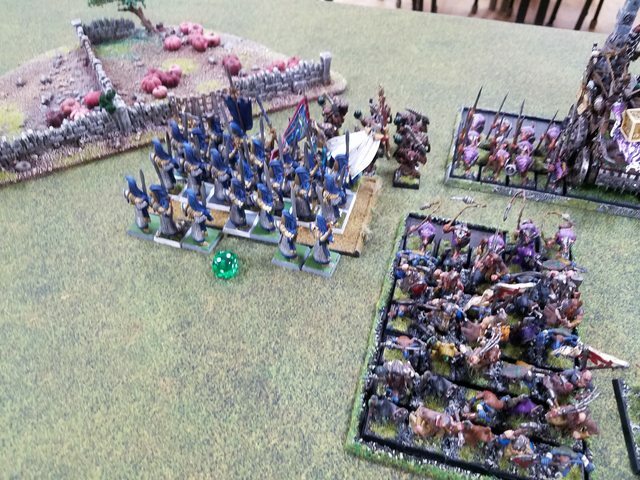 The larger Spearmen block then fails their rerollable LD9 panic test and flee through the Rat Ogres, losing 3 elves and landing right in their path. It's now do or die. Both High Elf flanks have been turned and the Skaven are largely untouched. The best defense is a good offense, though. 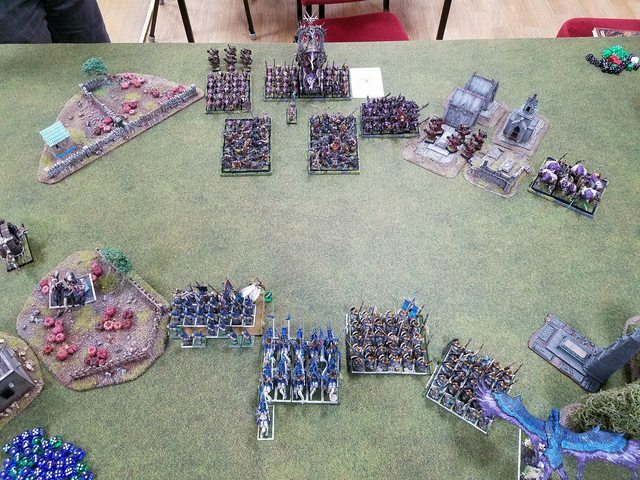 So the Dragon Princes charge the Stormvermin and the Swordmasters charge the Clanrats, avoiding the Slave blocks in the center that would slow them down. 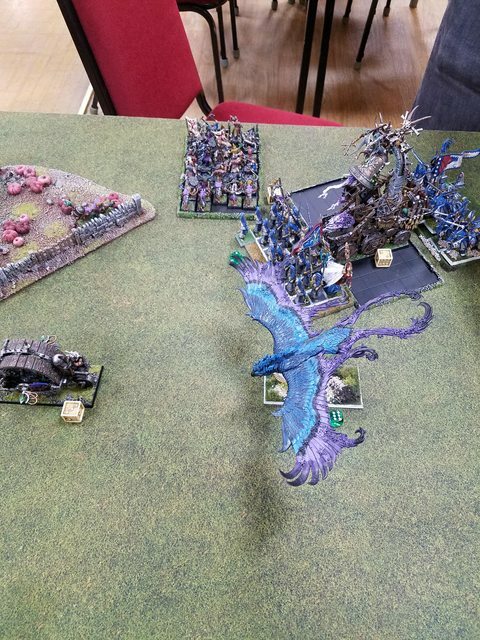 The Frostheart also charges the PWG to keep them from shooting into the Dragon Princes. 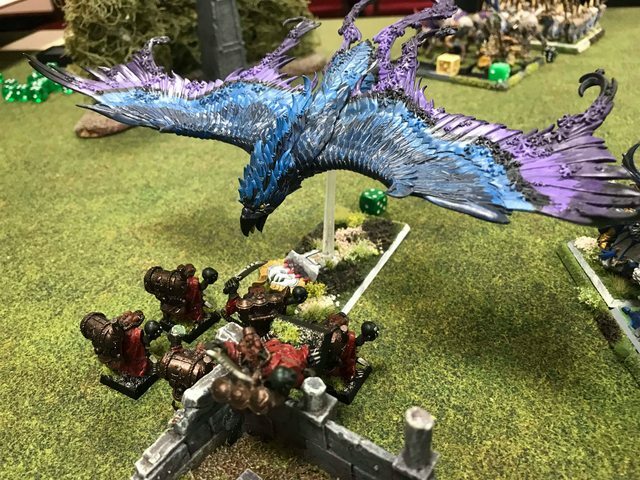 The Phoenix takes a wound on the overwatch, but all units make it in. 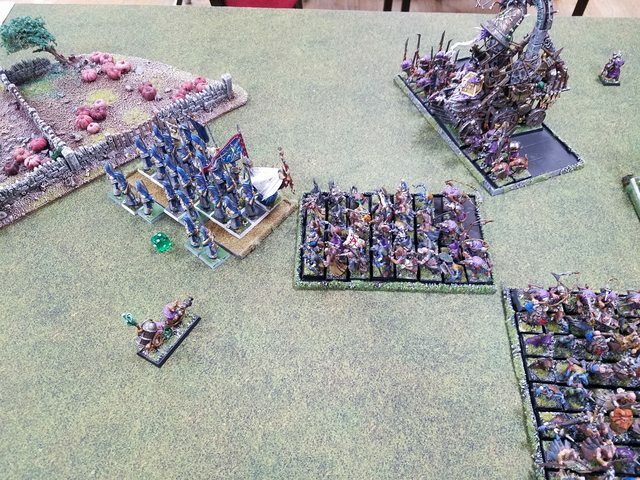 The Spearmen rally from their "tactical retreat" to face the Rat Ogres to the front and the last Reaver moves to cover them a bit from the Doomwheel. Apotheosis is cast on the Noble to give him fear and much more importantly boost the Swordmaster ward save. Walk Between Worlds is cast on the Reaver for the same reason. Convocation on the big Skaven block is dispelled. In combat the Swordmasters roll poorly and only kill 14 Clanrats, but they take no casualties in return, break the rats, run down the survivors, and overrun into the PWG behind. The Frostheart kills 4 of the PWG without damage and runs down the surviving 2. The Dragon Princes only manage to kill 11 Stormvermin (4 1s! ), lose 1 elf, and the Stormvermin are steadfast by 2 models. 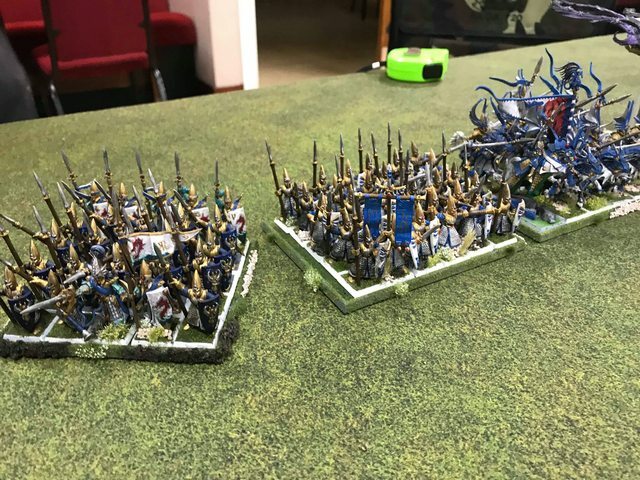 The situation has suddenly changed again, looking good for the High Elves. 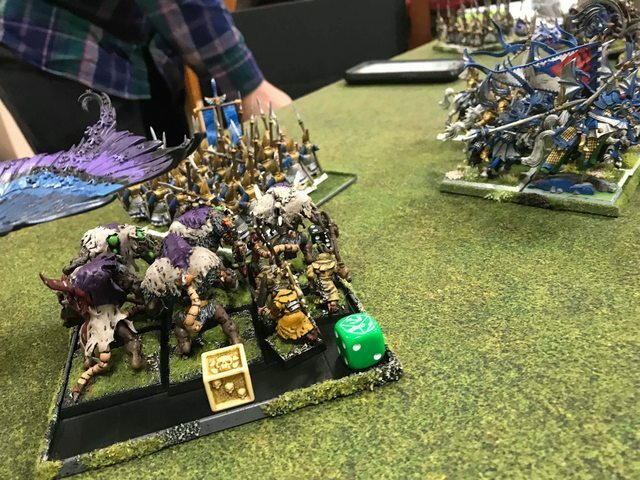 The Bell turns to face the inevitable overrun by the Swordmasters, one Slave block turns to face the Swordmasters as well, and the other Slave block advances towards the center to engage the Spearmen if the Rat Ogres fail. 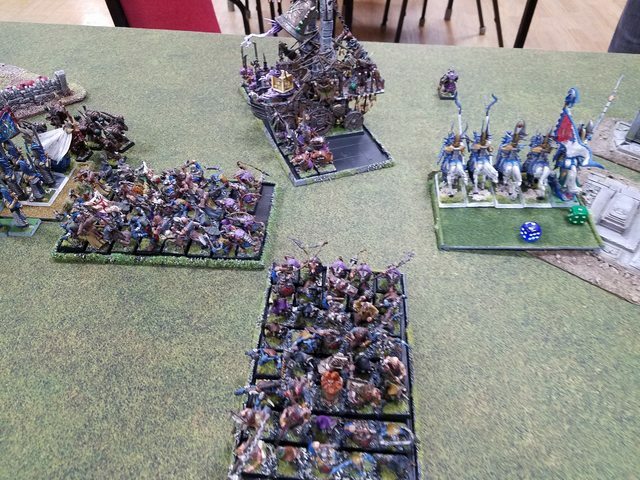 The Rat Ogres charge into said Spearmen and the Doomwheel turns back towards the Skaven lines. The Screaming Bell rolls a 13 and a Dragon Prince is killed by the ringing. 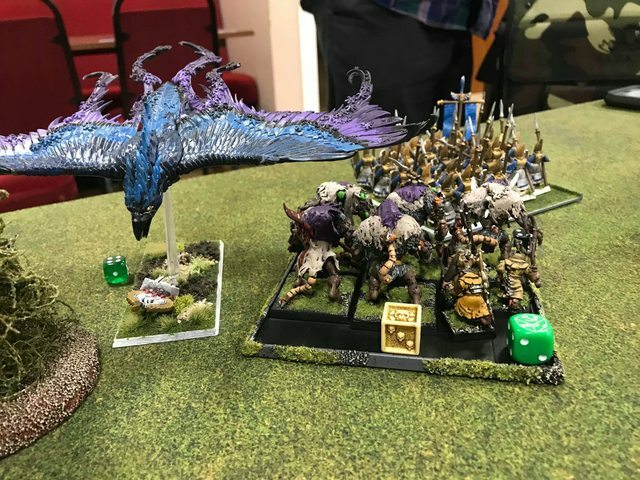 Magic then tosses Plague into the Dragon Prince-Stormvermin combat hoping to drop some Elves. The Noble takes a wound, but due to 2 lucky ward saves only 2 Dragon Princes fall. In exchange 8 Stormvermin die, not a favorable trade. The Warlock Engineer then snipes the surviving Ellyrian Reaver. In combat the Spearmen get very angry and kill 4 of the surviving 5 Rat Ogres, losing 5 Elves in return. They win combat and the Rat Ogres flee. 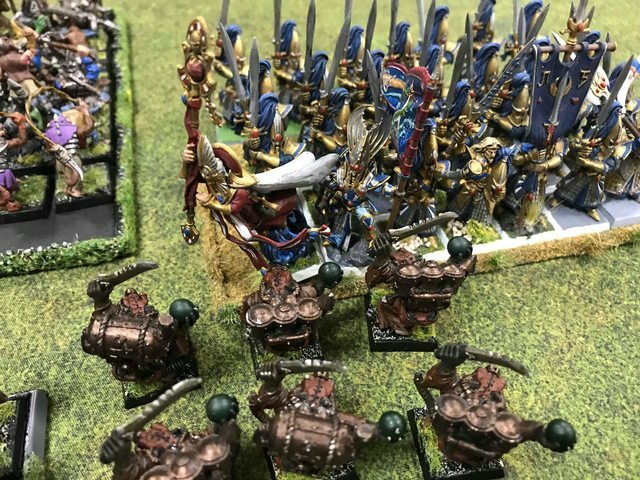 The Dragon Princes kill 6 of the Stormvermin at the cost of 1 more elf. 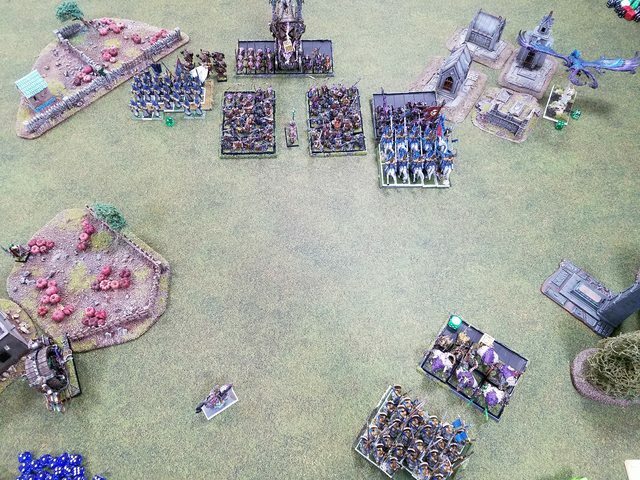 The BSB and Standard Bearer explode leaving just one rat left, who runs. Another Dragon Prince dies in the pursuit, tripping over a grave in the Mausoleum. Ironic. The Swordmasters destroy the PWG and reform to face the Bell. 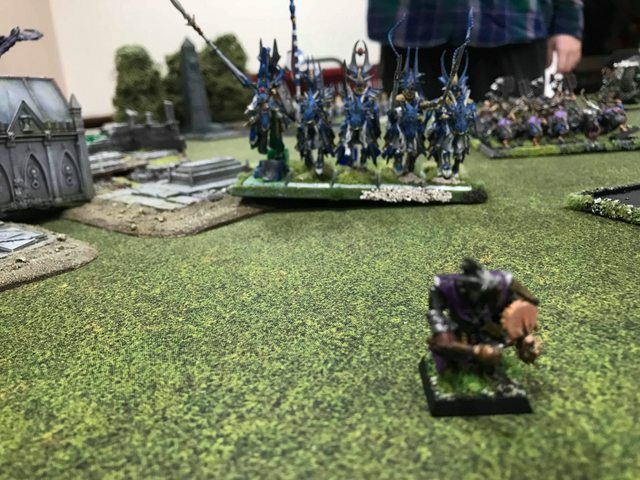 The Swordmasters charge the Bell while the Spearmen run down the last Rat Ogre. 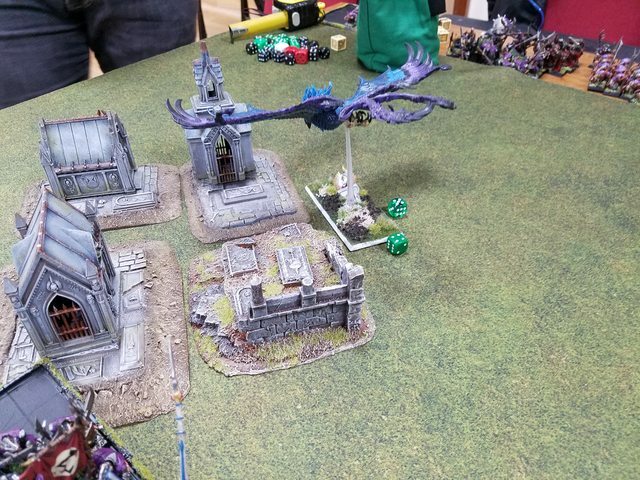 The Dragon Princes chase the last Stormvermin off the board and fail their redirect roll forcing them to advance a bit. 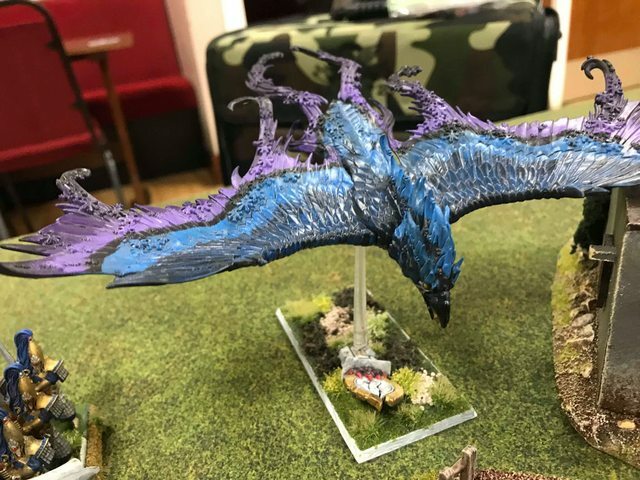 The Phoenix flies up behind the Bell unit to support next turn. Magic puts Walk Between Worlds on the Dragon Princes to allow them to turn to face the back of the Bell. The Swordmasters cut down 14 more Clanrats and put a wound onto the Grey Seer at the cost of 2 elves. The Slaves both reform again. 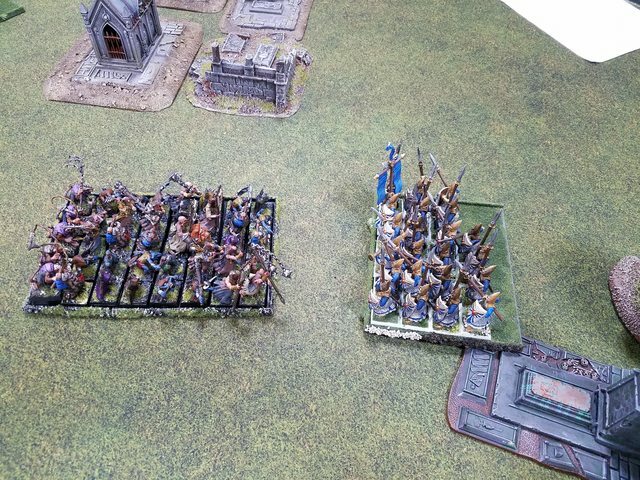 One of the blocks moves up to force the issue with the Spearmen that had just made it out of their charge arc. The other Slaves move behind the Swordmasters, and the Doomwheel advances towards the Bell. Plague into the Swordmasters is dispelled. 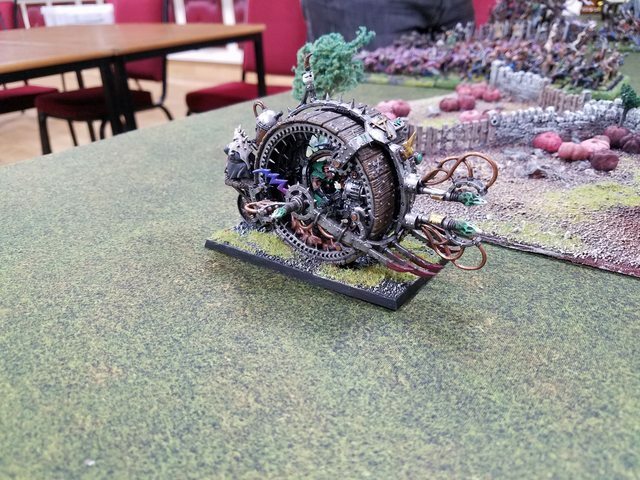 The Doomwheel misfires and gets dropped to only 2D6 of movement but takes no damage. The rest of the Clanrats are butchered by the Swordmasters and the Grey Seer falls as well. Two more elves fall to the rats. 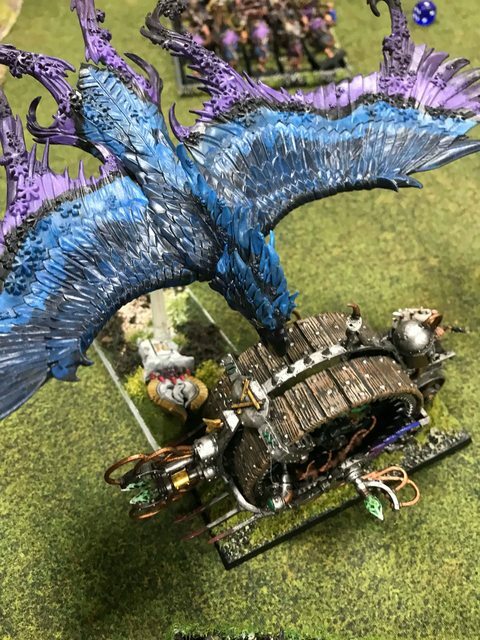 The Dragon Princes charge the back of the Bell and the Phoenix charges the Doomwheel in the flank. 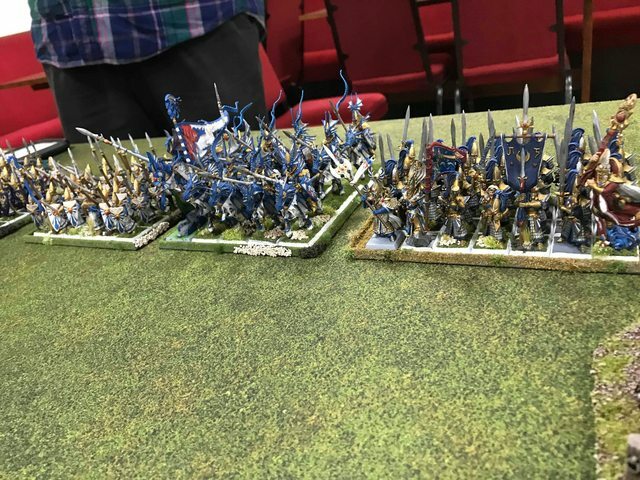 The Spearmen reform to face the incoming Slaves. The Anointed challenges out the Chieftan hoping for an honorable kill, but the despicable rat turned out to have the Armor of Destiny! So it only took 1 wound. 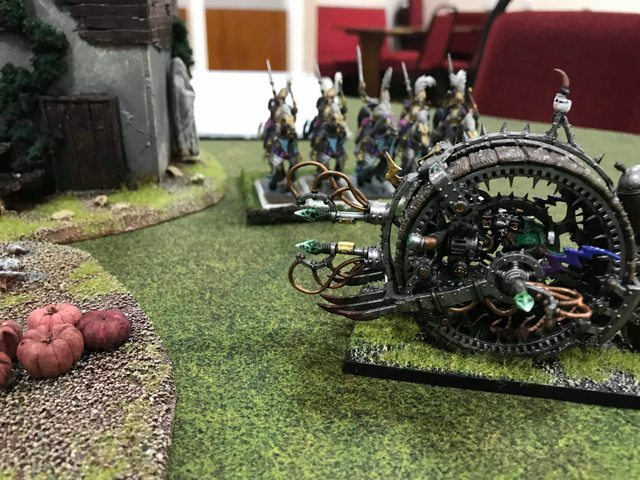 The Bell took 3 more wounds and the Doomwheel took 2. The Wheel broke from combat and fled through the Slaves who panicked. 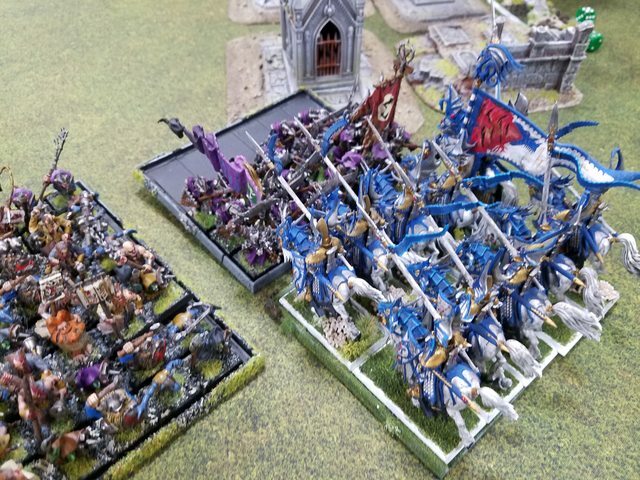 The Slaves charge the Spearmen while the fleeing Slaves run off the board and the Doomwheel fails to rally. The Spearmen kill 14 slaves at the cost of 1 elf, but the steadfast slaves hold. The Swordmasters kill the Bell and the Anointed kills the Chieftan. 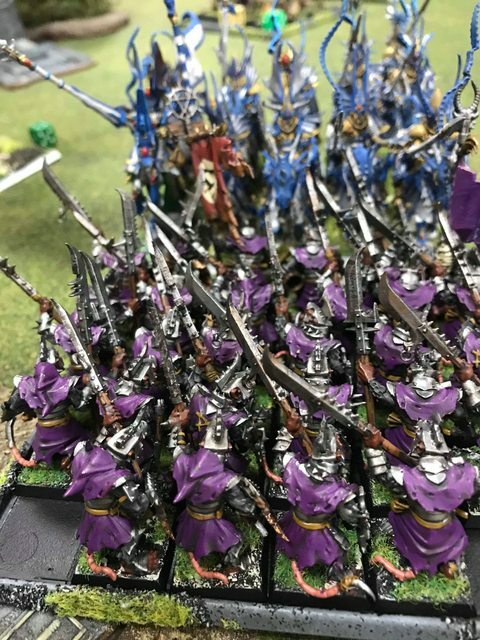 The game is called as a High Elf victory. First victory in the UK! 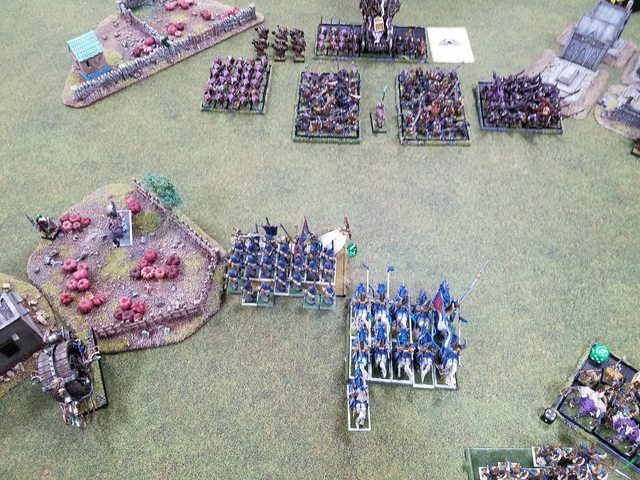 It was another good game, this time swinging decisively to the High Elves. I thought that I was in serious trouble after Turn 2 when the Spearmen were wiped out and the other Spearmen panicked. That panic ended up being a "perfectly planned" tactical retreat that saw the Rat Ogres cut down, though. 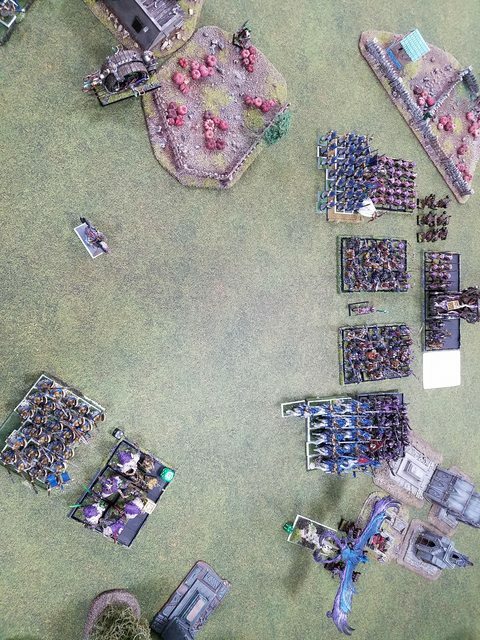 I think I played this game pretty well, avoiding the Slave blocks and their inevitable grinds and instead hitting the more important Skaven units on the flank. I also managed to advance very quickly after the Doomwheel got behind my line which worked out so that the Doomwheel then had to cross the board again keeping it out of most of the fight. I think my list was better optimized for the battle. Swordmasters are brutal against lots of ranked infantry and my opponent didn't have much shooting to stop them from making it to combat. The magic counter was also completely neutralized by the High Magic + Anointed MR combination which was amazingly effective. My deployment was a bit unconventional. 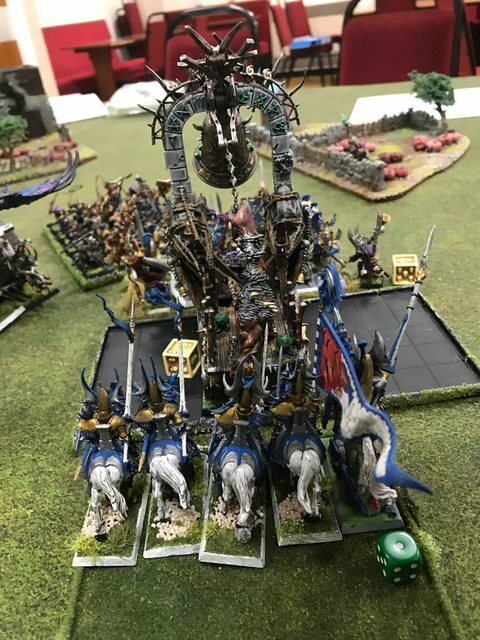 The superior mobility of the Dragon Princes was mostly wasted by putting them in the center, but my thought process was that in the center they would be very challenging to redirect away and should make it into the combat that they want to make it to. I'm not sure if I'd do it again, though, the center deployment was risky especially when my opponent was considering Plague and the Doomrocket, Plague would be out of range most of the time if they were on the flank. In the way of rules both of us forgot a few. Most notably in the chaos of the battle my opponent kept forgetting about his Assassin until after the turns were over and we were putting casualties to the side. The Assassin had been embedded in the Bell unit and might have been able to take out a character, though with my buffed ward saves it wouldn't have been too likely, so hopefully the game didn't swing too much by that omission. I also forgot that the Anointed gives his unit a 6+ ward save to start with, so my Swordmasters should have been even tougher. It was a fun game and I'm looking forward to my next! 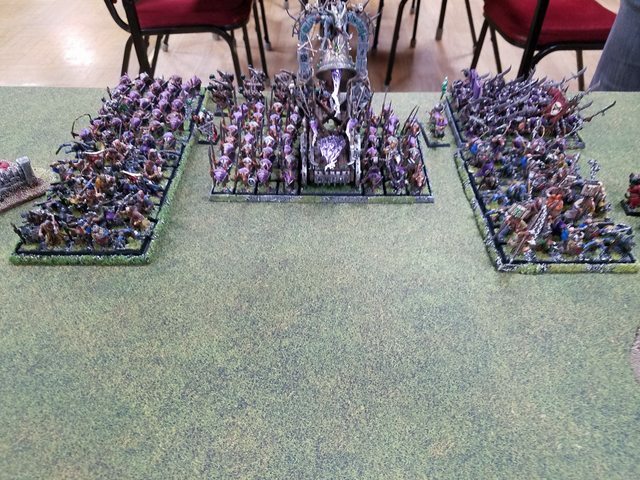 My opponent has been working on his Lizardmen army so before too long hopefully we can fight Elves vs Lizards! Thanks for that CR, great report! I like the terrain. You know what I think about the detail of your list (it's OK but could be sharper). Skaven list is the usual massed Infantry, I still feel it lacks Rares. I don't see the point of the Armour of Destiny guy and the Assassin should go Weeping Blade to kill characters. Four spells is not enough, oh and Scrolls. Gotta love the Rat Ogres! The terrain seemed to funnel the battle into the centre. 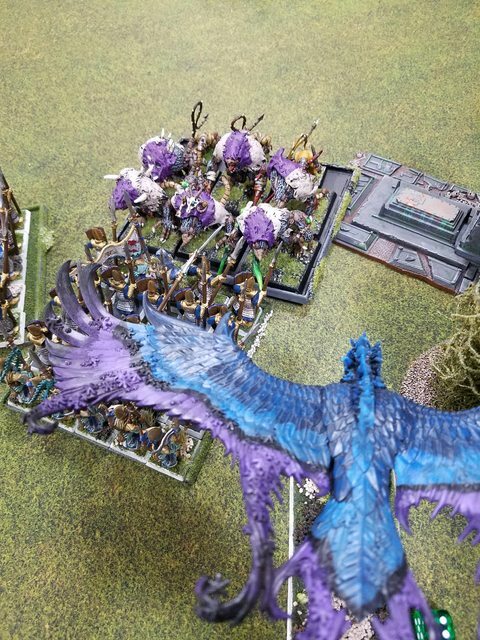 I was a bit concerned about the DP's being there, they got stuck on the Stormvermin for a round and that might have become a problem. Probably the Stormvermin should have been pushing the Bell. The Doomwheel did look like an issue, especially because you lacked shooting. I kind of liked your Phoenix redeployment though. I feel your pain over the Convocation running into Magic Resistance but the RIP bites regardless. That was a very helpful Doomrocket hit for your opponent! Even so, your Spears ultimately dealt with the Rat Ogres, their lack of saves is a killer. The decisive moment seemed when you Overran into the Globadiers. The almost guaranteed Reform and charge in your next turn was priceless. Without Dreaded 13th or at the very least more Rares the Skaven will struggle to deal with this unit. Skaven list is the usual massed Infantry, I still feel it lacks Rares. I don't see the point of the Armour of Destiny guy and the Assassin should go Weeping Blade to kill characters. Four spells is not enough, oh and Scrolls. Gotta love the Rat Ogres! Some rare shooting definitely would have helped this game, I suggested the Plagueclaw just because S2 isn't as much of a disadvantage against T3 and the big template makes it harder to miss. A WLC could also have helped fight the Phoenix. He also said that he didn't bring an Abom purely to mix it up some so he's not bringing the same thing every time. I think he's got something like 10k of Skaven, so it's a lot of models to get through! The Armor of Destiny Chieftan was I think just to try something a bit different again, as was the Assassin. The Weeping Blade would have been better, yes, but of course only if you remember about him! Both of us kept forgetting him since he was hidden. The terrain definitely did push the battle towards the center. Next game we'll have to try a more varied terrain setup with more things in the middle to change up where the fight happens. The Princes getting stuck against the Stormvermin was something I was a bit worried about. I had actually underestimated the size of the unit, thought it had fewer rats in it so I thought it would break faster. The Phoenix going into the PWG unit was actually supposed to be a defense against that to prevent them from shooting the DPs if they got stuck. 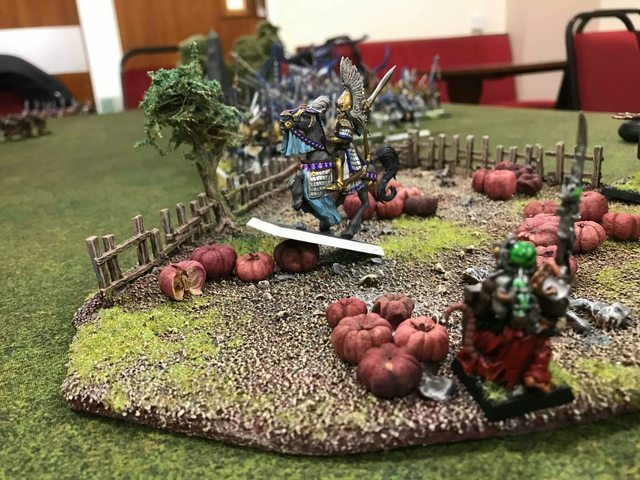 I also figured that Skaven infantry was one of the few units that DPs have a decent grind ability against as well, if they happened to get stuck. The Stormvermin pushing the Bell would have made the Bell unit tougher, but might also have made the Bell unit easier to encircle with my units since Clanrats would be easier to push through than Stormvermin. Though maybe not 50 of them! The decisive moment seemed when you Overran into the Globadiers. The almost guaranteed Reform and charge in your next turn was priceless. Without Dreaded 13th or at the very least more Rares the Skaven will struggle to deal with this unit. I definitely agree about the overrun. The Globadiers had been back there to try to shoot into combat on his turn, but unfortunately the Clanrat block wasn't big enough for combat to last another turn, which meant that the Globadiers were instead a stepping block for me. They probably would have been better on the flank instead of directly behind the Clanrats. We actually discussed how to fight the Swordmaster block, and how it was a tough nut to crack. Since my opponent seems pretty set against the Dreaded 13th I think I may adjust my lists a bit to have less of a focus on deathstar units and try to spread out hitting power a bit. It could make the games more interesting and more tactically challenging for me and also reduce the problem of the untouchable unit that has very few counters. The Doomwheel was worth taking I think. 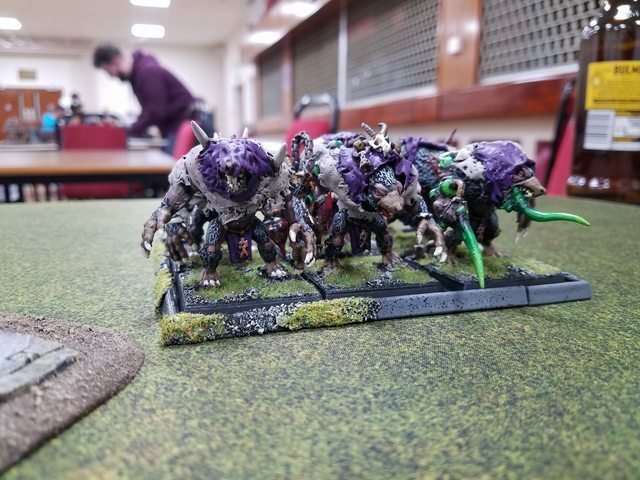 An Abomination really helps because it can actually fight, unlike most of the Skaven army. 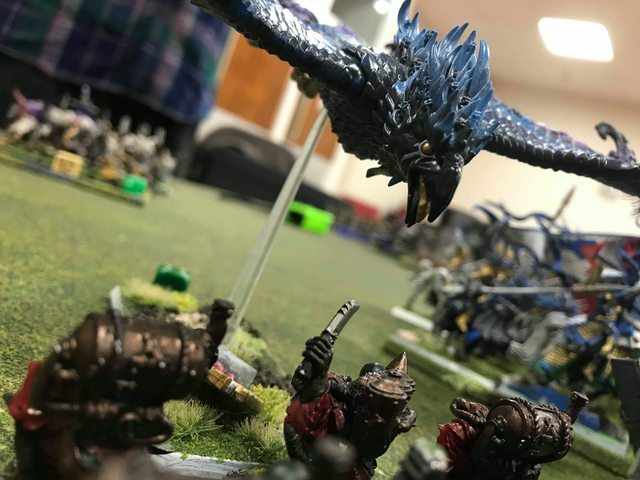 My Frostheart was shot down by a WLC last time. Your opponent simply needs more of any of these CR because each contributes much more than Clanrats/the second Chieftain. I suggest simply deploying the Assassin openly in the Bell unit. He won’t be forgotten! A 4-spell phase will get magic through. But too often it’ll be magic the opponent can live with. 8 Spells means that almost every cast becomes a must-stop because you can pick the nastiest options available. The DP’s are working OK so far because the Skaven are not bringing their full toolset, fair enough I guess. The Stormvermin need to push the Bell because the Skaven can’t really afford to lose it. The problem is the lack of Abominations or other fighting units to cover this unit’s flanks. Unfortunately, Deathstars are how the 8th Edition HE book works best. There are just so many unit-wide buffs. I feel that the player losing the game generally needs to rethink tactics and/or army list. But simply removing the Anointed would instantly help the Skaven deal with the Swordmasters because he makes these largely immune to damage magic, the best shot in this army’s locker. Congrats on the win. I think you made the right choices in being slightly careful and slow to engage. The main thing was not panicking after the spearman loss and the unfortunate panic. Redirecting a doomwheel (or other random movement unit) is a bit an art in itself. The main thing to keep in mind is that it can only move straight ahead after its initial pivot. So you force it to either charge the unit you're redirecting with or to move in another direction entirely. If you're cheesy, you could try railroading the unit (as in, place a unit next to it so it can't pivot but it also can't charge the unit). But I consider it fairly unsportsman-like. The phoenix relocation was crucial I think. Monsters don't like standing next to a doomwheel. The ZZZZZAAPP can dish out too much hurt to them. I do think convocation on the Bell unit was a good call. Though MR decreases the effectiveness somewhat, it made sure you could deal with the bell in combat. It took off 32 rats and a wound on the bell. Which would have been difficult to get through in combat. In my mind as HE you want to be stuck in combat as short as possible. This maximises the effect of going first and it means that the biggest weakness of HE (paperthin armour) is negated somewhat. The terrain was in your favor this battle. 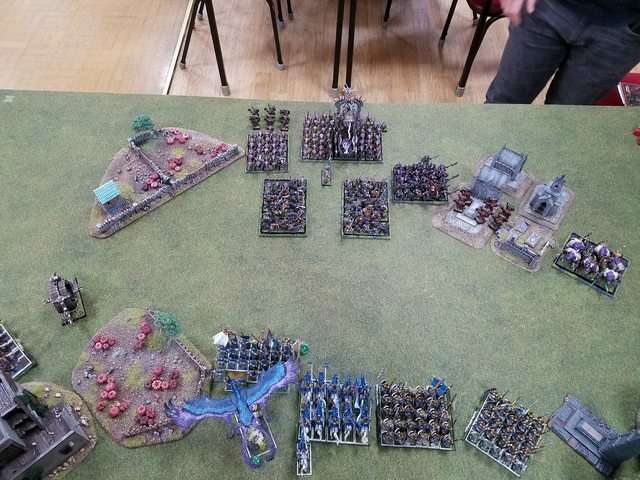 It meant that there was relatively little room to exploit the swarming skaven blocks. And HE have a very high damage per inch of frontage. So they're in a better position to take advantage of the small space. 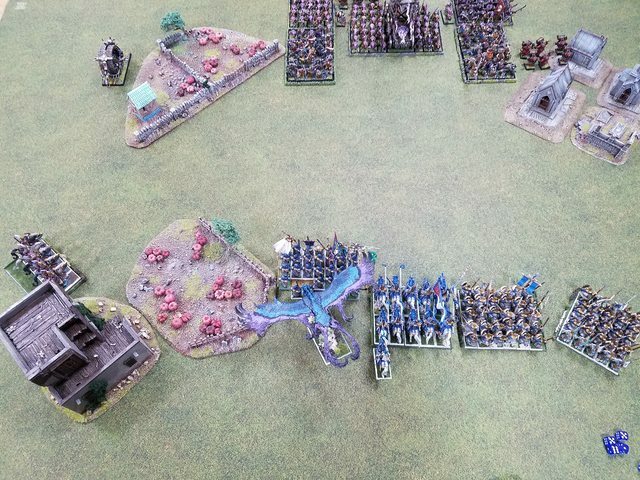 It also meant you had relatively little risk of being flanked and it forced you to keep your battleline together. An added bonus here was having a flying model, which doesn't care about the small maneuvring space but can go where he's needed. As for the 4 spell phase. I think it works well enough, though it is perhaps a bit on the low side at 2500pts. And a lvl1 or 2 with a scroll would have made a big difference here already. But if you only bring a lvl4 to a 2500pts battle then you need some other ranged threat. And that was what was missing here. You had board control because your opponent had no way of forcing you to fight somewhere. He had little threat at range (as did you to be fair, though you had some more mobility to compensate). And indeed, your opponent had little that could deal damage. 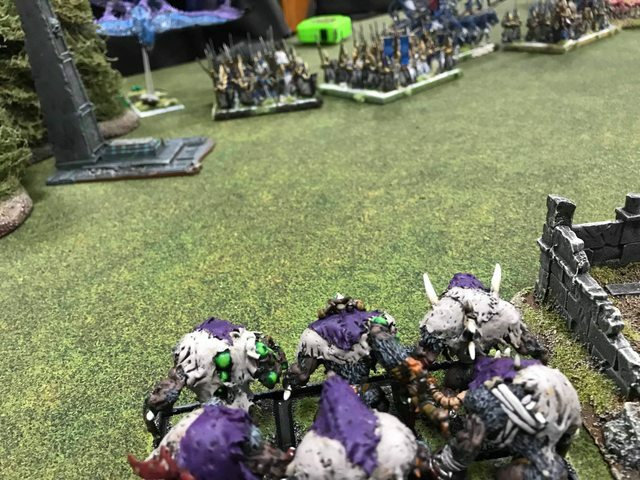 At 6 strong, the rat ogres are more a support unit then a main combat unit and Stormvermin only are S4 (which works ok on phoenix guard because they simply don't die but isn't enough to really dish out pain).